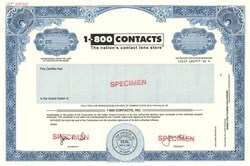 Beautiful engraved specimen certificate from the 1-800 Contacts incorporated in 1997. This historic document was printed by United States Bank Note Company and has an ornate border around it with a vignette of the company name. This item has the printed signatures of the Company's President and Secretary. 1-800 CONTACTS was founded in 1995 by two entrepreneurs who sought to address contact lens wearers' basic frustrations. Wearing contacts themselves, they understood that contact lenses could be expensive and inconvenient to replace. With that in mind, they set out to offer low prices, convenient ordering and fast delivery to their customers. Their plan to accomplish this centered on buying contact lenses in large quantities to get the best prices and housing a large contact lens inventory so customers' prescriptions would be in stock and ready to ship. Superior customer service and easy ordering were also key to their plan, two benefits that distinguished them from the competition. Today, 1-800 CONTACTS is the world's largest contact lens store�, selling more contacts every day than any other optical goods retailer. 1-800 CONTACTS stocks more almost 10 million contact lenses (the world's largest inventory) and delivers over 150,000 every day directly to customers. The company's growth is a testament to the benefits it offers to contact lens wearers seeking a hassle-free, quick and affordable way to replace their contact lenses.